i know, i know. many of the things i blog about are things that my awesome mom has done. maybe i'm just trying to ride her coattails, whatever. her stuff is amazing and needs to be shared. i have invited her to just partner with me on the blog and write her own posts, but she is too lazy/technologically-challenged/proud to do so. so i'm going to continue sharing her projects. her christmas decor this year has a super fresh and organic feeling with lots of metallics and greenery. Enjoy! i am obsessed with bobette's bar cart. we bought it for my wedding and used it for... it has the perfect geometric pattern embedded in it's metal barring. of course now that she painted it gold we love it even more. is anyone else going through a phase were you want to spray every piece of furniture gold?? a few years ago bobette had everything in our house painted black, and we are slowly converting all of those pieces to white or gold (or just getting rid of them entirely). this is what the bar cart looked like in february (sorry for the crappy iphone-at-night shot). 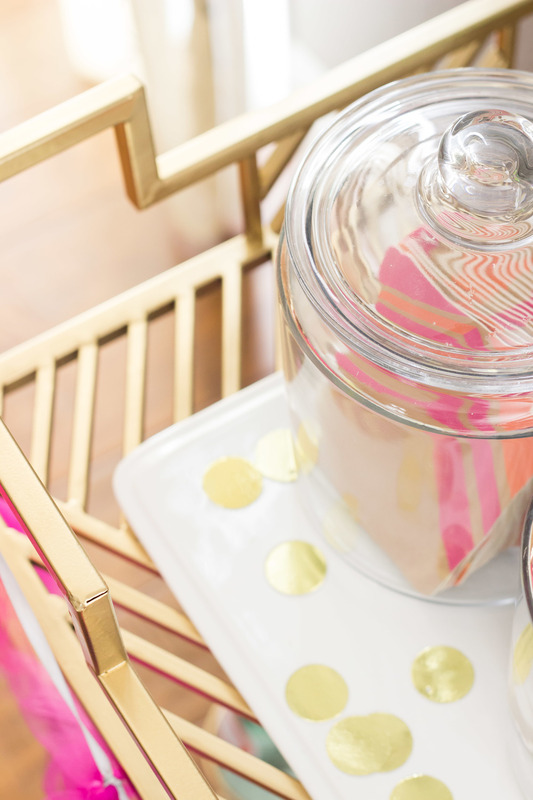 many of the same basic elements we kept: the reindeer head that bobette found at homegoods, the ikea shelves above, the actual bar cart, and some of the accessories like jars, plates and cups. then bobette somehow found a way to style it even cuter. 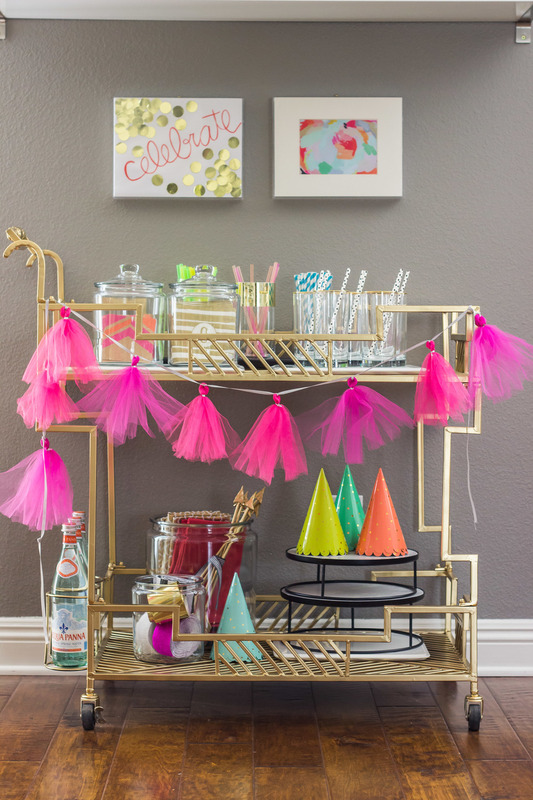 she went with a 'party theme' and included things like the oh joy for target party hats, the fun streamers we end up using at lots of events, our favorite coasters, some pretty napkins, our new marble platters, the water carafes we use for entertaining, and her growing collection of straws. we found those lucite frames at the thrift store for $2 each. the picture on the left was made by yours truly (using an orange sharpie, computer paper, and oh joy! gold confetti). the picture on the right was the back of the fall anthology magazine. up top she used (from left to right): more water bottles, our vintage gold rimmed glasses, gold rimmed platters from target, a rainbow cake that my sister made, a cupcakes cookbook from anthro, my favorite fleur de lys tumblers from anthro, a decanter, and garden fresh roses as pretty as peonies. what do you think? do you like it before or after? we are obsessed with this new set up.